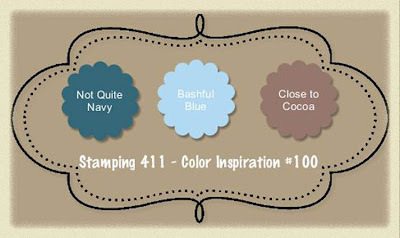 Welcome to the first ever Color Inspiration here at the Stamping 411 blog. Color is defined as the quality of an object or substance with respect to light being reflected by the object, usually determined visually by measurement of hue, saturation and brightness of the reflected light. Color plays a very important part of papercrafting. Every Thursday I will present you with a different color combination. 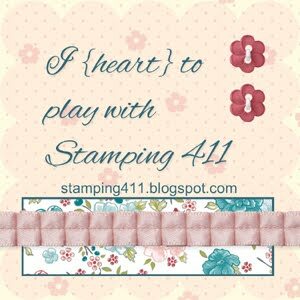 These color combos might come from a catalog, something I see at a store, from one of the Stamping 411 operators, a pile of scraps on my stamp table or from one of our loyal readers. Each week I will switch it up to keep you on your toes. For my first color challenge, I started with one of my favorite colors (and often underappreciated): Not Quite Navy. 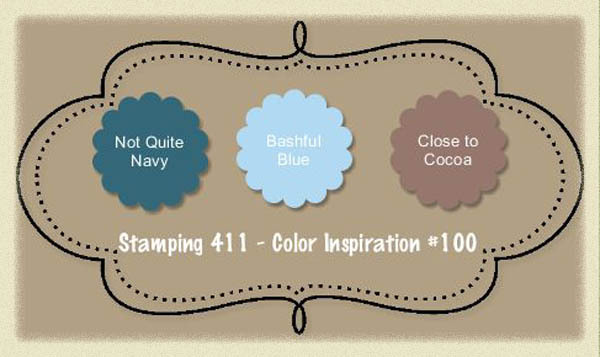 I then grabbed my Color Coach and picked two complimentary colors: Bashful Blue and Close to Cocoa. I can totally see this color combo for "guy" cards. Aren't those often the hardest to make? I made a Christmas card with this color combination. 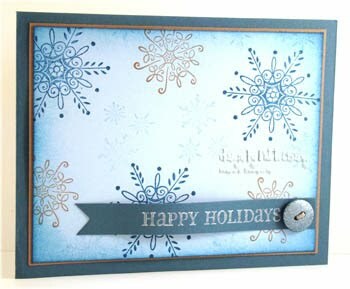 I could easily substitute a different sentiment for a fabulous wintry card. Unlike the Saturday Sketch Challenges, we will not have a Mr. Linky at the bottom of the Color Challenge posts. If you choose to take the color challenge, feel free to leave a link to your card in a comment at the bottom of this post. I would love to see what you create!!! If you have a color combination that you would like featured, email it to me!!!! Check back tomorrow to see the operators' top five favorites of the week. So pretty! I love these colors. Thanks for doing this Patti! I can't wait to play along. I have to run errand first! Drat!!! Way cool Patti! I hope to have time to play today! My entry is here Thanks for looking! Love this challenge Patti! AND your card is just beautiful!!! I can't wait to get a moment and try my hand at these colors!! 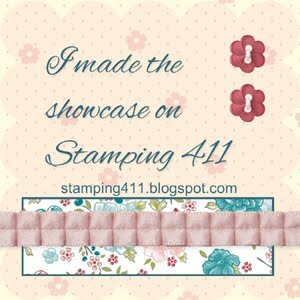 Ok Just posted above but now see how (I think) to link the blog where you will find mine card. This computer stuff is to new to me but I'm learning. This was a fun and challenging challenge! Thanks for the inspiration. Cool sketches and color challenges! I just love these colors and they were right for my fish bowl.